The relationship between Prince Charles and Princess Diana was tumultuous, to say the least; they met after Charles first dated Diana's older sister, Lady Sarah McCorquodale, and only went on 12 dates before getting engaged in February 1981 and tying the knot five months later. By late 1992 (after collective affairs and embarrassing leaked audio conversations), Charles and Diana's 11-year marriage was a disaster - and the royal family couldn't hide it anymore. Charles's parents, Queen Elizabeth II and Prince Philip, met with the couple for an intervention of sorts. Philip and Diana exchanged heartfelt letters that Summer in which he expressed his disappointment at both her and Charles's extramarital affairs and asked her to see both of their slip-ups from the other's point of view; at one point he seemed ready to give up, writing, "I will always do my utmost to help you and Charles to the best of my ability. . . but I am quite ready to concede that I have no talent as a marriage counselor." Their attempts at reconciliation were unsuccessful, and that December, Prime Minister John Major publicly announced the pair's "amicable separation," reading an official statement from the royal family. After their separation, more rumors of cheating emerged, and Diana conducted a tell-all interview with the BBC's Martin Bashir in which she disclosed details about her own infidelity and struggle with bulimia as well as Charles's affair with Camilla Parker Bowles, making the famous quote, "There were three of us in this marriage, so it was a bit crowded." Ultimately, Elizabeth gave up too - likely fed up with doing damage control for Charles and Diana's cheating scandals and the blowback from Diana broadcasting their business, she sprung into action. On Dec. 20, 1995, Buckingham Palace announced that the queen had written separate letters to the couple ordering them to divorce ASAP, an unprecedented move at the time. "After considering the present situation, the queen wrote to both the prince and princess earlier this week and gave them her view, supported by the Duke of Edinburgh, that an early divorce is desirable," a palace statement said. It added that both Elizabeth and Philip would "continue to do all they can to help and support the Prince and Princess of Wales, and most particularly their children, in this difficult period." Charles agreed formally in writing soon after, but it took Diana until February to announce her agreement after negotiations with Charles and representatives for Elizabeth and until July for the couple to agree on the terms of their divorce. Queen Elizabeth reportedly wanted to let Diana keep the style of her royal highness, but Charles was "adamant" that she give it up. Their divorce was finalized in August 1996, but some drama surrounding her title ensued. Queen Elizabeth reportedly wanted to let Diana keep the style of her royal highness, but Charles was "adamant" that she give it up - instead, she was given the title Diana, Princess of Wales. The loss of the honorific separated Diana from the rest of the family in such a way that she had to curtsy to those that had it, including her own children. Heartbreakingly, a 14-year-old Prince William is said to have comforted his mother after the loss of her title by saying, "Don't worry, Mummy, I will give it back to you one day when I am king." Diana was allowed to keep her apartment at Kensington Palace - which now serves as the official residence of William, Kate Middleton, and their two children - as "a central and secure home for The Princess and the children." She was given access to the royal family's jets and was able "to use the state apartments at St. James's Palace for entertaining," as long as asked the queen's permission first. She was also permitted to keep all the jewelry she amassed during her marriage, with the exception of the Cambridge Lover's Knot tiara, which Elizabeth gave to her as a wedding present after only wearing it once. It was lent to Kate Middleton in both 2015 and 2016. Buckingham Palace publicly stated that as the mother of heirs to the throne, Diana would continue to be regarded as a member of the royal family and "will from time to time receive invitations to state and national public occasions" at the invitation "of the sovereign or the Government." 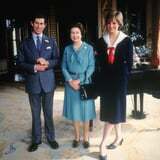 She and Charles were granted equal access to Prince William and Prince Harry, who were 14 and 11 at the time, respectively, and the boys alternated holidays with each of their parents when they weren't attending boarding school. Things seemed to be civil between Charles and Diana as they worked together to coparent their boys after the divorce and up until Diana's death in August 1997. During an inquest into the tragedy in January 2007, Deputy Coroner of the Queen's Household Baroness Butler-Sloss said, "I am satisfied that at her death, Diana Princess of Wales continued to be considered as a member of the Royal Household."